One of the biggest challenges when you start eating low carb is getting used to eating without bread. But, there are plenty of keto breads you can eat when following this diet, and in this article, you’ll learn how to make one of them. It’s light and fluffy, and the closest to a standard bread you can find. You can also make a subway bread using this recipe, using creative fillings like ham, meatballs, and bacon. If you use the ingredients to make six buns, each of them will contain about 3 grams of net carbs. 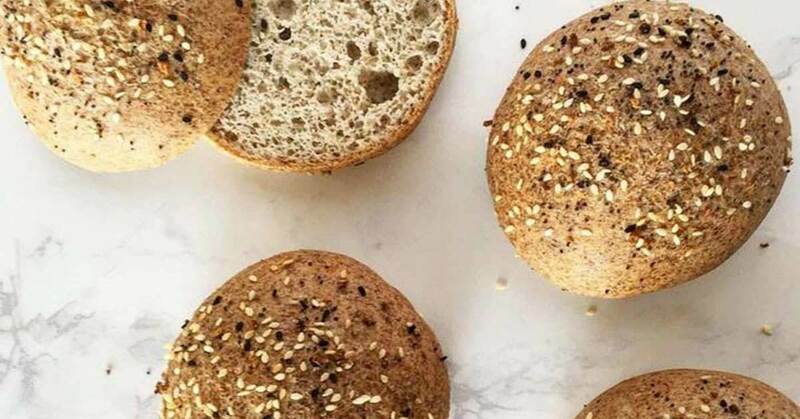 Here’s how to make this delicious low-carb bread for buns and rolls. Recipe inspired by Maria Emmerich. Mix all ingredients. Then, divide the batter into six pieces and shape them into balls. Make sure you flatten each ball so it’s one centimeter thick. Use the egg yolks to glaze the buns and sprinkle sesame seeds on top of them. Put them in the oven and bake for 30 to 40 minutes on 350F. Have in mind that your batter might turn purple when baking because of the psyllium husk powder. Whether it turns or not, the color doesn’t change the taste. You can use xanthan gum as an alternative to psyllium husk. Here’s a slightly different recipe from the one above. Mix the dry ingredients into a bowl and pour the boiling water. Add the vinegar and whites. Use a hand mixer to beat the ingredients for around half a minute. Just don’t overmix it. The dough should have a Play-Doh-like consistency. Shape the dough with moist hands into four to eight pieces. You can shape them into hot dog or hamburger buns. Grease a baking sheet with some oil and lay the buns. Place the baking sheets with the buns on the lower rack of the oven. Bake for around an hour, or until you hear a hollow sound when tapping the base of the bun. Serve and enjoy! You can store them in the fridge.